No Boring Lectures! 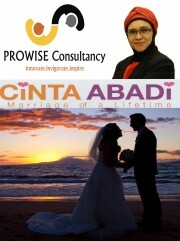 This 2-day Cinta Abadi Marriage Preparation & Guidance Course is highly interactive, engaging, experiential and yet fun. We'll guide you towards equipping yourself with the necessary knowledge and skills in building a lasting and stable marriage filled with love, romance and life-long commitment. This course interweaves Islamic values and relevant psychological concepts/techniques with proven effective marital practice that will enhance deeper awareness and understanding on relationships, couplehood and marriage through hands-on activities and games, self and couple reflections,and group discussions and interactions. This course is conducted by Certified Coach Rasimah Jar, a Psychology-trained Specialist, guest speakers of some of Mediacorp's Infotainment TV shows and a resident Coach for Radio RIA 89.7FM's weekly Talk Show in relationship issues and personal enhancement. Relationship Coach Rasimah has been coaching and counselling individuals, couples and families in relationship building and enhancement via her vast working relationships with many Malay/Muslim organisations, mosques, VWOs and the government since the 1990s. She has also lent her expertise and advice to various infotainment programmes on Mediacorp TV like Rudy & Rilla & Ah! Adam & Hawa shows, a weekly talk show on radio RIA 89.7FM, and wrote articles on relationship and marriage for magazines and the newspaper. Being blissfully married for 21 years and well-liked and respected by many of her clients and students, Coach Rasimah "walks the talk" about marriage and relationships. Join the course and pick Coach Rasimah's brain on how you can build a strong and stable yet loving, romantic and committed marriage. -Identifying ways to save your marriage if things get too hot to handle- Tips on sustaining your marriage. Our course package includes free-flow refreshments and tea breaks! Study materials are also provided. Our CINTA ABADI marriage guidance course is supported by ROMM, MSF and MUIS. Certificate will be given upon 100% completion of the course at the end of the second day. Call us at 9145 1182 or 6589 8455 (Rasimah) for enquiries. Allah's Messenger (pbuh) said - If the people knew the reward of the noon prayer, they would race for it, and if they knew the reward of the morning (i.e. Fajr) and Isha prayers, they would present themselves for the prayer even if they had to crawl to reach there.